"It was a tough race to start the day in race one – we don't seem to have much luck here – but the win certainly takes the sting out of that. "But I've finally got that race win which feels good because everyone all week has been asking me about when I was going to win one. I'm pretty happy to get our first win of the year – especially after the first race drama. I used the curb out of turn four like I normally do and it popped the tyre off the rim and ended my race. All I was thinking was 'There goes 80 points', you know. But we've got the win now and the car feels a lot better than last week." "I am pretty satisfied with today. We are making great headway with the new cars and we improved our pace from practice to qualifying and then even from one qualifying session to the other. "The first session was disappointing but being on row two helped massively for the second race. "Ultimately we weren't the quickest but clearly Frosty is flying and we should've had both cars on the podium today. "We have scored good points and with some more gains overnight and two good qualifying runs in the morning I am confident we will be battling for wins tomorrow." "I had two reasonable races today and we are improving overall with each race, which is encouraging. I've had a much better day today than at any other time this season and finishes like this are what we need regularly now. "I challenged the guys ahead early on but then my tyres dropped off. Towards the end I tried to hold them off and while I missed out on the podium, I had a good day." "Jason (Richards) was a very important part of the BJR and Team BOC family and I feel like I'm occupying his space at the moment. If we can go back with the trophy it will have pride of place in the Team BOC trophy cabinet. It would mean a lot to us. 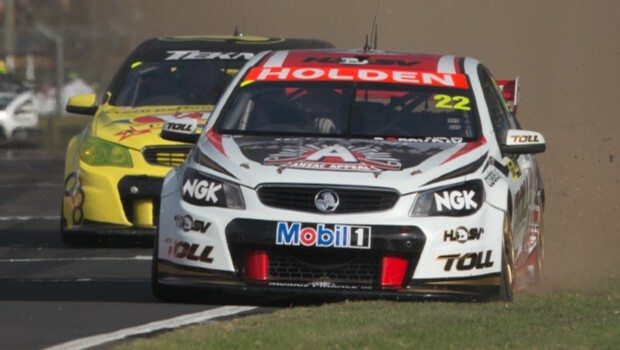 "I thought I'd lost it in that second race when I went off the track; I didn't know which fence I was going to hit, I was that out of control but I came back on behind Shane (Van Gisbergen) and passed him on the last corner of that lap. "The car was really strong. If we'd been in front we would have driven away and the tyres hung in as well, which all bodes well for tomorrow." "I'm really excited about scoring a top 10 result today, we're really hitting our straps with the car set up now and there are not too many corners where others are getting an advantage on us, it's only really one. "We know where our weaknesses are and we're really starting to build on our strengths, which is very exciting. "To jump into our first top 10 is great and all the way up to seventh. We're really focused on capitalising on other mistakes and aggression at the moment, but we did find time in that last race compared to others and that's what we're after. "Right now we're on a bit of a high and we just really need to back up with some solid results tomorrow to leave Pukekohe in style." "We made a couple of changes from the first race where the car didn't look after its tyres. We sharpened it up and we had a pretty racy Nissan Altima on our hands. "We were able to pass some cars, and we benefited from some carnage out there. "We need to focus on qualifying well tomorrow. If we can keep a similar race car, there's no reason why we can't run inside the top 10. "It's an encouraging day and we've been working very hard on our weaknesses. It's great to have two Nissans in the top 10 – now we've got to get some more up there." "It was a bit frustrating. We were looking good for a top 10 but four laps from the end, the car speed feel off the cliff. "It was great to see the other Nissans so strong and I think we can really improve from here. "This track suits us more, similar to the grand prix. The layout just suits these cars. That will be an ongoing trend through the year." "I had a really good day with car speed but things didn't turn out the way I'd hoped. The first race was disappointing with the tyre issue but I knew after that we would have a good car for the second race. "Once I cleared everyone and got up to second I chased (Jamie) Whincup down and caught him easily. On the last lap I thought I'd have a go at passing him, but it unfortunately didn't pay off and we missed out again." "I paid the price today for poor qualifying and while I finished the first race just outside the top 10 this track is similar to Tasmania as it is hard to pass. "In the second race we improved our pace but we started closer to the back and we could pick off a few cars but not as many as we'd hoped. We wanted to improve our tyre life and we did that which is encouraging but we must qualify better tomorrow as this race format makes it hard to come through the field." "The good news is the car is much better on the hard tyre for us with the way we set the car up and to come from eighth to third in the first race was incredible. "We made a lot of improvement on last week in race one and other than a little error in race two – I came in too deep on the brakes at five and just got the grass edge – the car was quick. It just lacked a little bit of rear again, so we'll talk to Jeromy (Moore, engineer). Looking at what we were racing around though, I think we had a very good car and setup. I'm much happier than last week and luckily we've got two more races tomorrow." "It's a shame we ended up having a real average run this morning in qualifying. The car wasn't real flash in that first race and we made a few changes for the last race and the car was quite a bit better. "Where I qualified the car, it was just too far back, the way the car is working at the moment unfortunately our strengths aren't in the areas that enable us to pass, so once you qualify back, you can only ever get one or two spots around a place like this. "Every time I got clear air in front I went half a second a lap quicker, so I just need to get qualifying right tomorrow and hopefully we can have a much better day. "Good on (Scott), he's obviously on the money, they've got a pretty good set up down there with their cars, so he's going to be up the front quite a bit this year, so like I said – good on him. "It's good to have a good young bloke in there, he seems like a real decent young guy too, so well done to him." "I am a lot more confident with the car's handling and balance today. We are making good inroads in the overall car set up. I had a good race car in both races but simply did not have track position to capitalise on it. This place is hard to pass and I was not getting out of Turn 4 as well as I needed to and that restricted any real forward movement. It was a bit of follow the leader, but again I feel we will have a good package for Sunday." "Today was really up and down for the #17 Wilson Security Falcon. "The car is awesome over one lap and this really helped Qualifying for Race Six. I had a good battle with the Nissans and had (Russell) Ingall behind me, but I had a problem with downshift and Russell was through. "Our tyre life over the race distance was tough and I really had to keep my elbows out a bit to ensure I could hold on in the final laps. "Another Top 15 is a great reward for the team. We are pushing really hard to stay there! The second race was ruined when we were pinged to the rear of the grid. I had to roll out of the throttle to avoid (Lee) Holdsworth and that was about it. I followed Jonny (Reid) for most of the race but could not really move up any higher." "You come over the last couple of laps and everyone is cheering. It was quite hard to concentrate and when I came over there for the last time it was awesome and to see fans up. "I had goose-bumps, like literally, I had goose-bumps. It was crazy, so I can't thank my boys enough and my parents and everyone who has got me here, it is a big day. "(After the second race) I said to the boys on the way in that it's a crap result but I had a pretty awesome first time win. You can't do much about those incidents, so I just took it on the chin. We have moved up to fourth in the Championship, so I am happy – nothing is going to spoil my day at the moment. "